Preheat oven to 350°. Prepare cake mix according to package directions, baking in two 8-inch square baking pans. On wire racks, cool 15 minutes. Remove from pans and cool completely. Trim tops of cakes to flatten. Wrap cakes in aluminum foil and freeze at least 2 hours. Remove cakes from foil and on serving platter, arrange 1 cake. Scoop Breyers® Original Extra Creamy Vanilla onto cake, smoothing to form an even layer. Top with second cake, pressing down slightly. Freeze 5 hours or overnight. Frost cake with 1 can frosting; return to freezer. For decorations, write spooky messages or draw cats, bats and witches on cookies with gel. With scissors, cut off top halves of circus peanuts for "fingers". Snip gum drops for "fingernails"; set aside. Spoon remaining frosting unevenly onto cake to make "graveyard ground". Sprinkle cake with cookie crumbs for "dirt". Press decorations into frosting. Add gummy worms and "fingers". 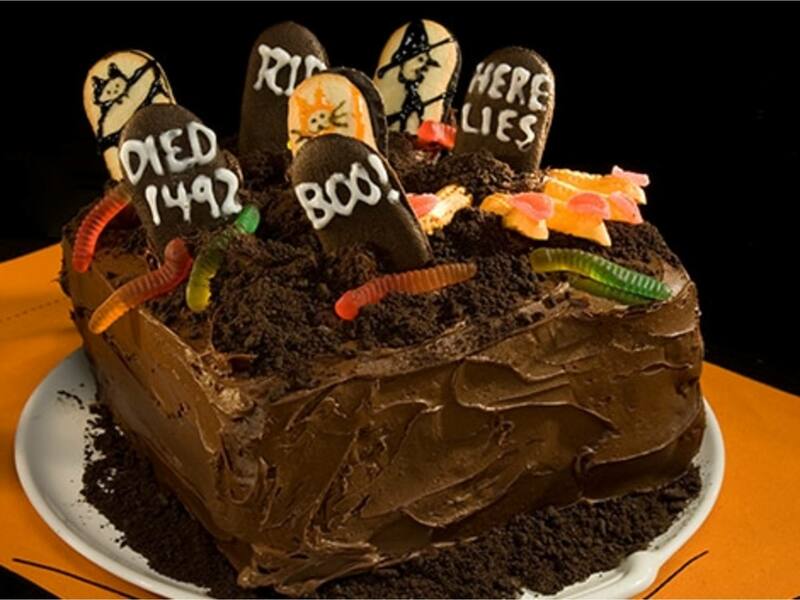 *Graveyard Decorations: 7 chocolate-filled oblong chocolate and/or vanilla sandwich cookies, black, white, orange, and purple cake decorating gels, 20 chocolate wafer cookies, crushed (about 1 cup), 5 circus peanut candies, 5 red gumdrops and gummy worms.